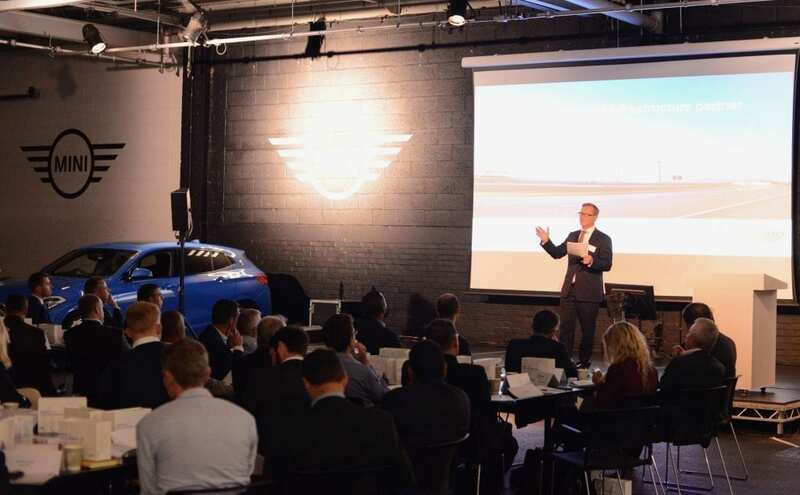 Industry leaders met at BMW's Mini Plant in Oxford to discuss the electric vehicle shift, and the challenges and opportunities presented to businesses in making the transition. The market for electric vehicles is at a critical point, as it shifts from “early-adopters” towards mass market take-up. This is being driven by policy as ministers seek to decarbonise transport and improve air quality; and by an increasing customer awareness of and interest in electric vehicles. The UK government’s recent announcement that it will ban the sale of all petrol and diesel cars by 2040, along with commitments made by many major automotive manufacturers and growing consumer appetite, have shone a spotlight on EVs. It was with this in mind that delegates met at BMW’s Mini Plant in Oxford for the first event of its kind – Accelerate, a unique working group hosted by Utility Week, and its sister brands edie and Network. Attendees at the event heard from six industry experts, before splitting into four working groups to discuss the key challenges and opportunities facing businesses in making the EV transition. The event – held in association with BMW, EY, UK Power Networks and the Energy Systems Catapult – also provided participants with an opportunity to take their own electric vehicle test drive and tour of the plant. During the discussions it became clear that utility company fleet managers are keen to exploit the benefits of EVs, and many feel duty-bound to be early movers in the adoption. However, the challenges extend beyond the expense of buying the vehicles. The availability of charging infrastructure is a challenge that must be overcome before EVs can be widely adopted into fleets. One attendee expressed frustration that “the infrastructure just isn’t there”. UK Power Network Services head of markets Phil Hack, in his presentation, questioned how a company should charge its fleet. Should they wait for a national charging network, or ask employees to charge at home? This prompted further discussion about how employees should be reimbursed for the electricity they use in charging a fleet vehicle. In UKPN’s group, delegates agreed that end-user businesses are cautious about adopting fully-electric vehicle fleets while charging infrastructure is limited in terms of size and location. In the meantime, many are exploring alternative low-carbon avenues such as biofuel-based vehicles. Among the suppliers in EY’s group there was broad consensus that incompatibility of charging infrastructure is a major issue that needs to be addressed, both in terms of hardware and billing systems. Consumers want to be able charge their vehicles at any charger they come across without having to worry about whether they have the right charging socket or the right card. There was a clear preference for a market-led solution to the challenge of delivering infrastructure, although some participants suggested there may be a need for government intervention if charging providers are unwilling to come together to resolve the problem. That said, there was also agreement among attendees that a lack of accessible on-the-go chargers is unlikely to be a significant roadblock to the mass adoption of electric vehicles in the medium term. Because most vehicles are used primarily for shorter commutes, most charging will take place either at home or at work, especially as the range of electric vehicles increases. The real barrier to uptake, delegates suggested, is the upfront cost of electric vehicles. The tipping point will come when battery prices fall far enough to achieve cost parity between electric vehicles and those with an internal combustion engine. The running costs of EVs are already significantly lower, and the vehicles themselves are generally easier to maintain than a traditional vehicle. Charge points will also need maintaining, and it is imperative they are reliable. More joined-up thinking is needed, and collaboration when it comes to installing charge points, to ensure they can be used by the maximum number of people. There is also a challenge when it comes to the slightly different set of skills needed to drive EVs. They require an alteration to the driver’s lifestyle, as well as a different thought process. Employees need to be incentivised to treat their vehicles properly and, in order to make sure they get the most out of them, training is required. Fleet managers suggested it should it be the duty of EV manufacturers to provide an induction course as part of the package. Elsewhere in the room, in the Energy Systems Catapult group, delegates agreed a whole-systems approach to the issue of decarbonisation was needed. Eric Brown, director of innovation, Energy Systems Catapult, highlighted the importance of avoiding “silos” and insisted the industry “must consider all the institutions, policies and practices that enable the development of services for consumers”. A wide range of views were expressed at Accelerate – but one thing was clear: whatever one’s thinking on the future of EVs, there was universal agreement that the tipping point is within touching distance. The decisions made today on this critical issue will determine businesses’ future. The challenges of adopting EVs extend beyond the expense of buying the vehicles. Fleet managers are cautious about adopting fully-electric fleets while charging infrastructure is limited in terms of size and location. The incompatibility of charging infrastructure needs to be addressed, ideally through collaboration between providers. A lack of accessible on-the-go charging is unlikely to halt uptake. The tipping point for EVs will likely come when battery prices fall far enough to make them cheaper to drive than those with an internal combustion engine. A “whole-systems” approach is needed to ensure the benefits of EVs are realised, and the challenges overcome.